Whether it was in middle school or mid-life, nearly all of us have been on one side or another of an unrequited love. In the throes of it, it can really feel like love, not the one-sided infatuation the rest of the world sees it as. Of course there is an Irish story about this. Our endless trove of legend and literature is one of our best Irish gifts. And this is a true story with a happy ending, which is unusual for us and might be why it hasn’t received that much interest in the last century. We all love a head over heels romance, eyes meeting across a crowded dance floor, hearts pounding and the feeling of absolute certainty usually experienced only by teenagers and Disney characters. But this is a real story, and there is none of that. We don’t know exactly what he was thinking, and it’s possible he didn’t himself, but he then proposed to another much younger woman he had known for several years… and she said yes. They married quickly, and apparently quickly feared they had made a dreadful mistake. But this is real life, not a movie, and they worked through a rocky start. While the husband was famous for his intellect and his words appear on a variety of Irish gifts today, the wife was no dummy either. She focused on what they had in common, specifically their shared interest in the occult. And their relationship flourished. While William Butler Yeats will be forever remembered as the man who pursued Maude Gonne so persistently despite her consistent lack of attraction to him, it is worth noting that he did eventually snap out of it and find love. 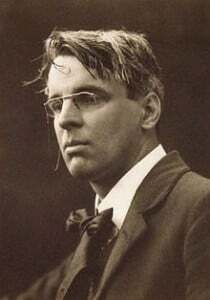 For Yeats, it seems life did begin at 50. After that milestone birthday, he married Georgie Hyde Lees and then some years later became a senator in the Irish Free State. He may have lacked the passion and certainty of a teenager, but he had the wisdom and tenacity of age on his side. Optimism is another of the Irish gifts, and it was decidedly optimistic of him to propose to young Georgie. It was also fairly optimistic of her to marry an older man well known for his unrequited love for another. But in the end, they had two children and it seems they were indeed quite happy together.